Editor: OB’s Dog Beach is truly a model for other cities. Here is a comparison of Dog Beach in Ocean Beach and other San Diego dog areas with those in Atlanta, Georgia, and is part 3 in a three-part series that examined the similarities of two leading convention cities – Atlanta and San Diego. San Diego – San Diego built what a plaque says is the nation’s first leash-free dog beach, in 1972, at a time the beachfront community was blossoming into a surfing capitol and the Haight-Asbury of southern California. City leaders never turned back from their decision to provide a place for dogs and their owners to play together off leash. And they show it’s possible to combine leash-free with free-range play areas for pets, as opposed to the fenced-in areas common in Atlanta. 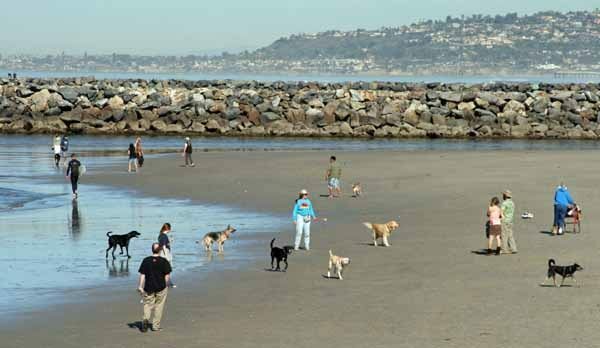 Today, San Diego has 14 leash-free dog parks, according to the parks department’s website. Popular nomenclature dubs these leash-free parks as “dog parks,” as if parks where companion animals can’t be set free aren’t dog friendly. On any given day, dogs and their companion persons are playing catch with Frisbees on Dog Beach, said to be the nation’s first leash-free dog park; chasing balls at Doyle Community Park; and jogging together along the 5.2-mile asphalt path on Fiesta Island, a manmade island in Mission Bay. Regulations are similar to leash-free dog parks in Atlanta. Folks enter off-leash areas at their own risk and accept full responsibility and liability for their dog’s actions. Owners are required to clean up after their dogs. However, one difference between the dog parks in San Diego and Atlanta is access to waste receptacles. In San Diego, bags filled with pet poop can be dropped in receptacles that seem to be abundant enough to be convenient. In Atlanta, receptacles sometimes seem to be few and far between. A more meaningful distinction is that dog parks in San Diego are wide-open spaces. Meaning, there are no fences, as there are at the leash-free area of Piedmont Park and O4W Freedom Barkway. Dogs are free to run where they choose, which often depends on where their companion person throws a ball. That said, they seem to stick with their friends as opposed to chasing after newcomers, chases that create those moments when humans wonder if their dogs will “play nice” with others. The unofficial code of conduct is for humans to pay close attention to their dogs. That’s the case in Atlanta, as well. But at Cadman Dog Park, for example, dogs and humans tend to congregate in clusters that are closer together than is common at, say, Railside Dog Park at Castleberry Hill – which was built on a 2-acre site donated by Jerry Miller, who helped develop the neighborbood of former industrial buildings. At San Diego’s famed Dog Beach, in the Ocean Drive neighborhood just north of downtown San Diego, dogs and humans get out of their vehicles, cross a parking lot and sidewalk, and step onto sand. A fair number of folks arrive by bicycle. It’s not unusual to see a skateboarder being pulled by a dog. Dogs have free range in the park, all the way from the San Diego River toward the Ocean Beach Municipal Pier, the longest concrete pier on the west coast. The only worry is run-off that occurs following rain events. Signs caution against getting in the water because of contaminants that may have flowed into the river and Pacific Ocean. Dog Beach has been there so long, that there aren’t many people left that remember what it was like before we introduced dogs into a bird habitat. Most people called it the Flood Control Channel. Some called it Children’s Beach. It was popular with families that had small children. It was our own little slice of Mission Bay. It also had a surf culture, because there was a hard sand parking lot that got you pretty close to the North Jetty. Some of my friends and I lived a sort of Huck Finn lifestyle in the river delta. Does anybody remember any opposition to Dog Beach? I only have vague memories that Maureen O’Connor and her power machine were behind it. Was it thrust on OB much in the same way that we’re getting police cameras rammed down our throats? Yes, Dog Beach has been there a long time. That doesn’t make it right. I haven’t gone down to dog beach for over a year. There are too many people that just let their dogs go and don’t even watch them. People don’t pick up after their dogs, I’ve even seen people bury their dogs crap in the sand! And there are too many aggressive dogs whose owners don’t control. I like to go to the unofficial park at the cliffs. Another major change happened about 1983. The city bulldozed an emergency cut through the sand plug to allow a Mission Valley sewer break to flush out. This changed the sand and the surf. It also cut off public access to the jetty. This was done without meetings or discussion. We accepted it as a necessary emergency action, but the cut in the beach is still there three decades later. When I was a kid most cars had water in their radiators. Now they have toxic chemicals. So I don’t think we ever return to the days of parking on the hard sand. For a while there was a raised parking area near Smiley Lagoon, But that was shut when the police said they didn’t have the manpower to deal with it. The final straw was two people in sleeping bags getting run over by a car. That area now has sand dunes for birds. I like it better that way. The History of North OB is a long story, and worth piecing together. I think a coalition effort of surfers, birders, divers, and fisherman could restore a lot of the sixties ere splendor. Does anybody have any old photos or stories to share?